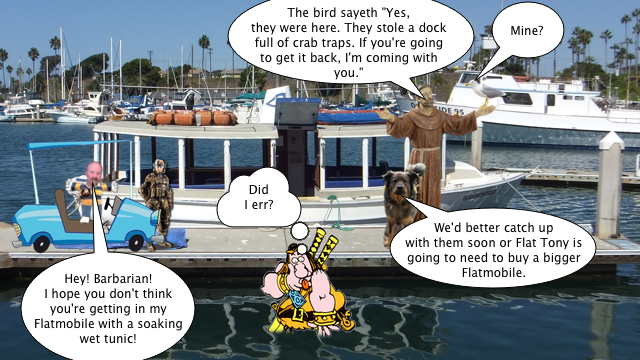 hello nice reederz its dennis the vizsla dog hay wel we hav departed frum the oshunside harbor with owr kargo of abandond seefood traps and hav deliverd it to the faymus meksikan restawrant casa de bandini so now “flat stanley” and i ar at owr taybel eeting komplimentary homemayd torteeyah chips and salsa and preetending to be hyoomans chek it owt!!! 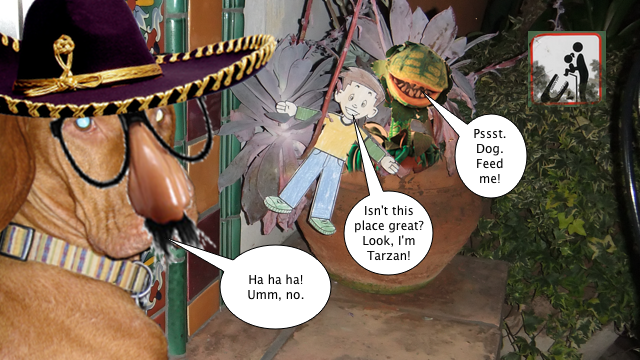 unfortchoonatly it seems we hav chosen the day wen the kalifornya deepartment of chips and salsa has deesided to mayk a serprize inspekshun of casa de bandinis komplimentary oar dervishes to mayk shoor they meet there aparently eksakting standards!!! aparently this involvs eeting all of the chips!!! wich only mayks sense wen yoo think abowt it after all it cud be that the verry last chip is the wun wot is not up to code!!! i do sort of wish the inspektor had left us sum but oh wel wot kan yoo doo??? that is wot happens heer in the mithikal land of kalifornya!!! 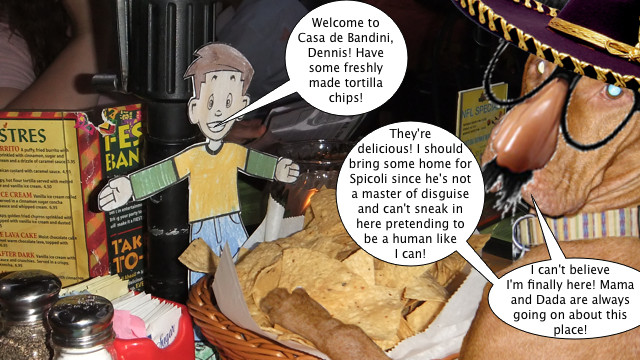 sinse we now hav no more chips and salsa to eet “flat stanley” and i hav a littel time to kill wile wayting for owr meel so lets hav a luk arownd at sum of the luvly dekorayshuns and potted plants and wotnot that help to transform casa de bandini frum a simpel owtdoor mall restawrant into a littel peese of meksiko in the mithikal sitty of carlsbad!!! beeing a sumwot chilly afternoon we wer fortchoonat to be seeted rite nekst to a fireplayse to help keep us warm!!! maybe a littel too warm!!! ha ha ha!!! 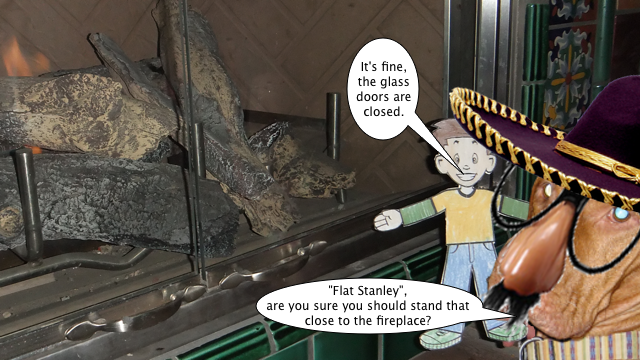 lukkily for him “flat stanley” only sufferd miner berns this time!!! otherwise we wood hav had to hav them print him owt on cash redjister tayp or sumthing!!! 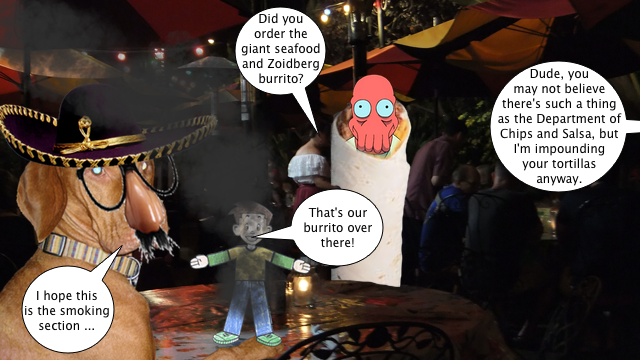 he put the fire owt himself by dooing the faymus stop drop and roll or in his kayse stop drop and lie flat tekneek and wuz down to a low smolder by the time owr jiant burrito wuz reddy!!! 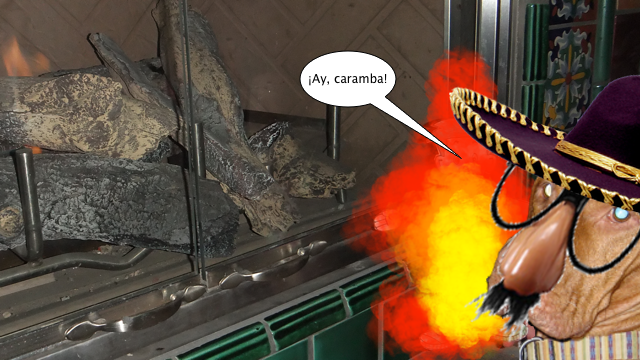 mmmmm zoidbergrito!!! and imadjin my serprize wen sumbuddy sent a dessert to owr taybel and then sat down withowt eeven beeing invited sutch nerv!!! ← Wordless Wednesday: Kneel, Son Of Jor-El. Kneel Before Cod. That health inspector looked a lot like Spicoli except, of course, he was wearing a hat so he looked all different. 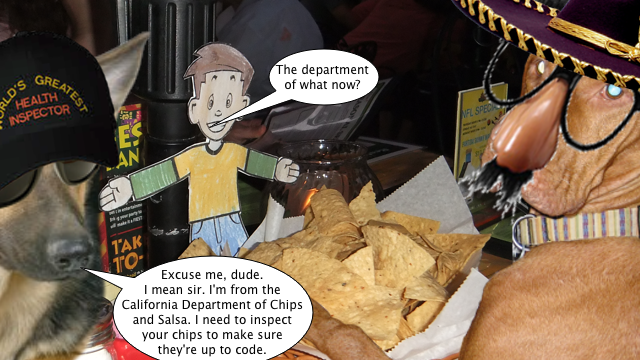 It’s good to know that our chips and salsa are protected by an ever vigilant government bureau. 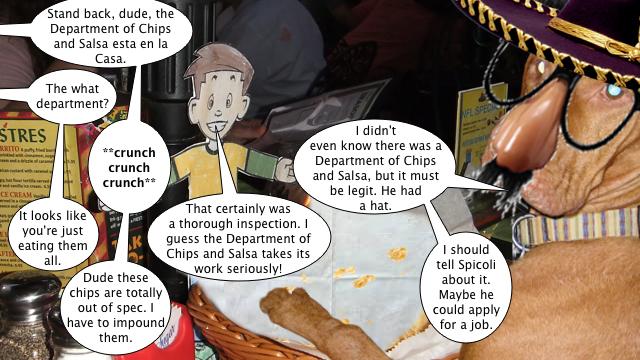 Hmmmm that WAS one suspicious Chip inspector…..
Dang, for some reason I am sure hungry now! 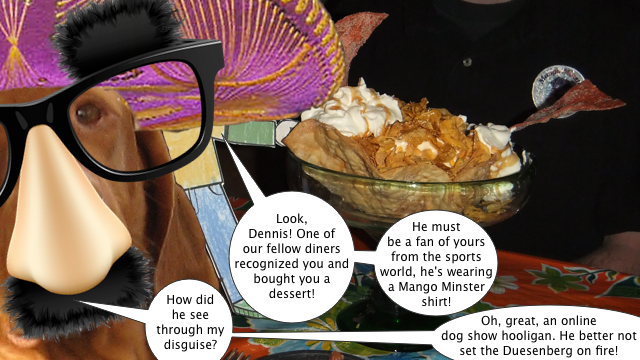 Hmmmmmmm…We are a bit suspicious of that Mango Minster shirt wearing dessert deliverer…..
We hope you get to eat the dessert. Jan had Mexican today and didn’t bring us home any chips n salsa. OK, so how long do we have to wait to find out who is wearing the Mango Minster shirt???? That looked like a fun place to dine. Sort of like the Casa Bonita from South Park.